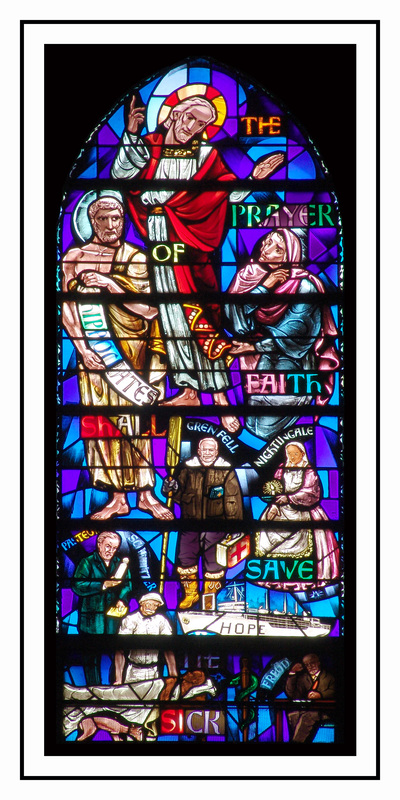 The prayer of faith shall save the sick are the words in this window dedicated to Healing. The large figure at the top of the window is Christ and the woman who was healed by touching his garment: “While Jesus was on his way he could hardly breathe for the crowds.Among them was a woman who had suffered from hemorrhages for twelve years; and nobody had been able to cure her. She came up from behind and touched the edge of his cloak, and at once her hemorrhage stopped. Jesus said, ‘Who was it who touched me?’ All disclaimed it, and Peter said, ‘Master, the crowds are hemming you in and pressing upon you!’ But Jesus said, ‘Someone did touch me, for I felt that power had gone out from me.’ Then the woman, seeing that she was detected, came trembling and fell at his feet. Before all the people she explained why she had touched him and how she had been cured instantly. He said to her, ‘Daughter, your faith has healed you. Go in peace.’” (Luke 8: 42-48). Below and on the left is Hippocrates, the Greek physician who first made the oath to heal all who come, an oath still taken by doctors. Lower on the right are Dr. Wilfred Grenfell, missionary doctor in Labrador, and Florence Nightingale, the nurse who helped heal on the battlefields of the Crimean War (1850-1853). Below Hippocrates on the left is Dr. Louis Pasteur, nineteenth century French doctor and scientist, who made the connection between germs and infection and who led the crusade among doctors to work with clean hands and instruments. Next to Pasteur is Dr. Albert Schweitzer, who went into the heart of Africa in the nineteenth century. To his right is the ship Hope which takes doctors, nurses, and medicine to all parts of the globe where there is need. In the lower right corner is Dr. Sigmund Freud, pioneer in mental health and psychoanalysis. This window was given to St. John’s in memory of William M. Conron in June 1969 by his family. The window is located on the south side of the nave, clerestory level, closest to the narthex. Location: South side of the nave, upper level (clerestory), closest to the narthex. Inscription: None in the window, but a brass plaque on the wall below the window indicates its dedication and date.